I may have been the last person to notice that ESPN College GameDay dreamboat staple Kirk Herbstreit has also been in the booth for that night's ABC prime-time football game. Oftentimes, those two locales are in different areas. But I think yesterday's cross-country trek had to be one a logistical nightmare on any number of ESPN traveling secretaries. I'll say It takes him 3 minutes to shake off his headset microphone and get to his courtesy van: 12:03 p.m.
Google Maps says it's a 23-minute drive from Autzen Stadium to the Eugene Airport: 12:26 p.m. I'll give him 15 minutes to get from the curb into the plane and dispose of his oversize tube of toothpaste: 12:41 p.m.
Another 4 minutes for tower clearance, demonstration on how seat belt works: 12:45 p.m.
A commercial flight from Portland to Boston's Logan International Airport is around six-and-a-half hours, so I'll give the same time from Eugene to Boston: 7:15 p.m.
QUICK! GET IN THE VAN! MOVE MOVE MOVE! 7:30 p.m. It's 24 minutes from Logan to Alumni Stadium: 7:54 p.m.
Another three minutes to run from the courtesy van into the press box: 7:57 p.m.
And that's how you do guesstimation on a grand scale. I'm sure at least four of my calculations are wrong, but I'm counting on two of those miscalculations offsetting the other two. If you want to give credit to ESPN somewhere in a "at least Mussolini made the trains run on time" fashion, the Worldwide Leader gets their sports personalities to the press box before the game begins, no matter what. But man, did they cut it close. Maybe next time, he should take the company teleport. CORRECTION: Commenter and No. 1 fan "Reasonable Doubt for a Reasonable Price" points out that a flight from Portland to Boston is 1½ hours quicker than its round-trip counterpart on account wind resistance. 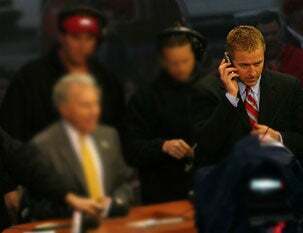 So Herbstreit probably got into Alumni Stadium around 6:30 p.m. Told ya I did something wrong.